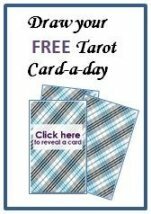 Have you ever been asked; Do you use those scary Tarot cards? Hhhmm I do use Tarot cards but really they are not scary or not more or less scary than a movie or a book. On a basic level they are pieces of cardboard with images on them. It is the interpretation and the meaning we attribute to the Tarot cards that might be perceived by some as scary. If you ever have or had a reading were the reader was making you fearful with the images and interpretation of the cards you are in the wrong place………RUN. It is highly unethical to make people fearful of Tarot cards. 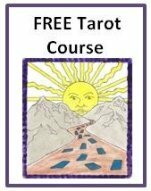 If possible ask if your Tarot reader is affiliated with a Tarot organisation like the Tarot Guild of Australia. If they are they will abide by a code of ethics which means that they will read with your best intentions at the heart of the reading. A good reading should be empowering, refreshing and perspective giving. And although some images are a bit darker, there are really no scary tarot cards. To prove my point here is a collection of video’s on all the Tarot cards that I can see as potentially scary tarot cards. They are each explained in terms of why they could be scary and how else we can see them. Irrespective if Tarot cards appear nice or scary, remember each Tarot card has a positive and a negative meaning. We can think of the Sun as only a positive card but too much sun can be damaging (read bush fires, heatwaves – can you tell I am an Aussie ;-) We need a mixture of experiences to grow, challenge and develop as individuals so challenging cards are good whether they are bright and cheery or a bit darker and deeper. On this page we will look at the Devil card. Truth to be told there are better looking figures around and the fact that we are chained to this guy does not help with feeling at ease. But can I ask if you have ever looked one of your devils in the eye and challenged them? I am sure you have. What happened? Did the Devil lose its power over you? Did you felt the fear and did it anyway? On a basic level we can look at the devil when we go on a rollercoaster ride on a large scale we walk away from abusive relationships. The behaviour we display is in both cases is positive and liberating. Therefor dealing with the devils in your mind and in your life can be life changing and very positive. I did not say easy but which worthwhile cause is easy? The Other video’s will displayed and explained on another page click Scary Tarot cards part 2 , part 3 and part 4 for more videos.